The 3 day Lime Plastering Course teaches the essential techniques for successful plastering with lime. The aim is to equip you with the knowledge of lime and ability to plaster a wall, on your own to a good standard using one of the oldest building materials around. The course is suitable for: both men & women, home owners, builders, beginners and improvers. No previous plastering experience is needed; being a personalised course means that we can start right at the beginning, or from a point that you want to improve your skills from. The techniques of plastering are taught and then practiced over the 2 days using lime. All courses are 100% practical. Tuition is given through a series of demonstrations and then instruction whilst you are plastering a wall. You will be plastering yourself for the majority of the time, so if your arm aches the use of tea & coffee breaks can be utilised! The 7 golden rules to ensure flat, smooth walls. The Lime Course is professional but informal and due to just being 1:1 means that it doesn't have to follow a set format but one which will suit your objectives. Floating mortar ready to accept top finish coat. Either hydraulic lime or non hydraulic can be used depending upon your requirements. Is plastering with lime more difficult? The key to successful working with lime is understanding how it works. The technique for applying the backing coat or render coat is no different to a sand & cement or gypsum plaster. However things can become a little more unpredictable with applying the finish coat but on the other hand once the process is understood it can be easier - in part due to the extended setting times that lime gives. The setting time of lime plaster is days rather than the hour or two from gypsum which whilst can be limiting for commercial aspects can be a very big advantage to the learner. With just yourself on the course we can start when you get here. The start time is generally 9.15, however it should be no problem to change this time to suit your journey. Finish time is between 3:00 & 4:30 pm depending upon your work rate. 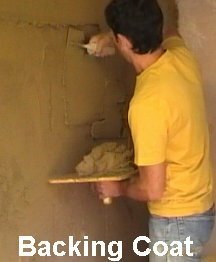 The 3 day Lime Plastering Course costs £700 per person. £150 deposit is payable now. The remaining balance of £550 is payable on the day of your course. Alternatively you can make payment in full. Sorry this course is currently unavailable.